Justifiably popular and very easy to grow from seed, Eschscholzia californica are one of the easiest and most colourful annuals to grow, they bloom profusely over a very long season, succeed in all soils and garden positions and are heat and drought-resistant. Extremely attractive to both bees and butterflies, they require virtually no care and bloom profusely from mid-summer until the frosts in autumn and give a garden performance second to none. Believed to have been introduced in 1906, the deep rose-red satiny blooms of Eschscholzia californica ‘Carmine King’ are borne individually on long stalks. Remarkably uniform and neat in appearance, the elegant single blooms stand above lovely fine foliage and grow to a height of 30 to 45cm (12 to 18in). Breath taking in massed plantings or containers they are perfect for the front of the border, for groundcover or in a natural cottage garden type setting. Eschscholzia californica tolerate drought well and will only need watering in periods of extreme dryness. It does not need rich soil, and actually blooms best in poor soil. It tolerates most soils that drain well, as well as adapting to seaside conditions. Grow in full sun to encourage blooming as the flowers will not open in shade. The tapered buds open into long-lasting flowers with four satiny petals, 5 to 7cm (2 to 3in) in diameter. They form a shallow cup-shaped flower, perfect for bees to tumble around while being covered in pollen. This species does well in all zones, and although it is considered a perennial in hot areas, it is grown as an annual in temperate zones. They do not perform as well in areas where temperatures get below minus 4°C (25°F). If the plants are in an area that will not receive frosts, they can be planted earlier in the year, around February. Seeds are usually broadcast in spring, but in warm areas can also be sown in the autumn. Eschscholzia have a long taproot and dislike transplanting, so it is better to sow them directly outdoors where they are to flower. They do best in an open sunny open site as the blooms do not open in shade but will grow in most soils. Prepare the ground well and rake to a fine tilth before sowing. Mark the sowing areas with a ring of light coloured sand and label if sowing more than one annual in the same bed. Sow seeds in short drills 1mm (1/8th in) deep in rows 30cm (12in) apart once temperatures reach around 20°C (68°F). Seeds germinate in two weeks. The seedlings will appear in rows a few weeks after planting and can be told from nearby weed seedlings quite easily. Thin the seedlings out so they are finally 10 to 15cm (4 to 6 in) apart by early summer. 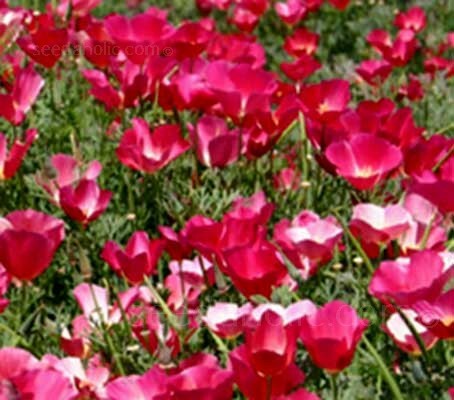 Alternatively, leave them to grow as small clumps, of 4 to 6 plants every 30cm (12in) or so. Keep the compost slightly moist, but not wet at all times especially in warm temperatures. Prefers well drained soil enriched with manure or compost ahead of planting. Feeding is rarely needed but water well if there are prolonged periods of drought. Apply complete plant food as growth begins in the spring. Remove spent flowers to encourage prolific blooming. At the end of the season, if required, leave a few plants to die down and self seed. Others can be pulled up and composted. Cottage/Informal Garden, Prairie Planting, Wildlife Gardens, Flower Borders and Beds, Container Gardening. Native to California, the flowers were first found along the Pacific coast in 1815 by a Russian expedition team. Dr. Johann Friedrich Eschscholtz, one of the members of this expedition team, was later honoured to have the California poppy named after him. Eschscholzia is the state flower of California. The species appear in various shades of gold and cover the hills of the Napa Valley in summer. It is protected by law prohibiting persons from picking or destroying it. The name is hard to pronounce. It's one of those you have to take a bit of a run at and miss out the c's - eh-SHOLTZ-ee-uh. Johann Friedrich Eschscholtz (1793 - 1831) was a Livonian physician, botanist, zoologist and entomologist. He was one of the first and most important scientists in the exploration of the Pacific, Alaska, and California. Born in Dorpat (now Tartu) in the Russian Empire. He studied medicine at the local University of Dorpat, and spending the main part of his career there: extraordinary professor of anatomy (1819), director of the zoological cabinet (1822), and professor of anatomy (1828). From 1815 to 1818 Eschscholtz was a physician and naturalist on the Russian circumnavigational expeditionary ship Rurik. He collected specimens in Brazil, Chile, California, the Pacific Islands, and on either side of the Bering Strait, Kamchatka, and the Aleutian Islands. One of the other naturalists was the botanist Adelbert von Chamisso, who took over Eschscholtz's specimens on completion of the voyage. The two were close friends and, after his early death Chamisso named the California poppy Eschscholzia californica in his honour. The results of the trip were published in the Berlin journal Entomographien in 1822. Grow in full sun The flowers will not open in shade. Sow direct in spring. Sow directly as it dislikes being transplanted. Flower Borders and Beds, Container Gardening.